Gamma is an A ranked member of the Millefiore Family, who leads the 3rd attack squad of Blackspell, and specializes in electrical attacks. He appears to be a merciless guy, drinking during his first appearance and also acts arrogant toward Shoichi. He seems to be waiting for Shoichi's 'special' project to be done before he and the Black Spell act. Lal Mirch reveals that he is responsible for wiping out many of the allies of the Vongola Family. 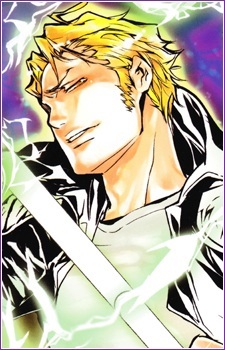 Later in the manga he temporarily joins the Vongola family to protect Uni from Byakuran. In the end of the battle against Byakuran, he dies together with Uni in order to revive the Arcobaleno and defeat Byakuran.